Salinas, CALIF (January 16, 2017) – Church Brothers Farms, a leading grower owned processor, promoted Josh Ruiz to vice president of ag operations. As part of his promotion, Ruiz will report to the CEO and Drew McDonald, vice president, quality, food safety and regulatory affairs. Ruiz’ previous title at Church Brothers Farms was director of harvest innovation. In his new role, he will be responsible for all farming and harvesting operations with the goal of leading both areas into a new age of innovation and automation. Ruiz started his professional career at River Ranch as an intern while he was an undergraduate student at Cal Poly. He went on to earn an MBA from Cal Poly, San Luis Obispo, and then started working full time at River Ranch, first as a planting schedule and crop planning assistant, then was promoted to broccoli supervisor where he helped develop an iceless broccoli program. Ruiz also spent time at Tanimura & Antle as general manager of harvesting, working directly for Bob Antle. He was promoted to director of harvest when he developed and refined cauliflower harvest equipment for the company that saved 25 percent of the labor costs and increased efficiencies and crew capacities. In addition to his work at Church Brothers Farms, Ruiz works for his family’s business, Twisted Roots, a commercial winery that produced 1,000 cases in 2014 and has a tasting room in the Carmel Valley, CA. In 2015 Ruiz was named one of the produce industry’s “40 under 40” by Produce Business. 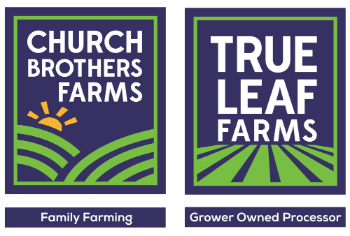 Church Brothers Farms is a vertically-integrated family owned and operated company that produces a full line of fresh vegetables year round with an in-house farming/harvest program and state of the art processing plant, True Leaf Farms. We are a grower-owned processor, farming the majority of our raw product ourselves; adhering to industry-leading food safety and quality standards. The Church family has a legacy of service and innovation.